Business process automation (BPA) is the use of technology to automate repeatable, day-to-day tasks. It accelerates how work gets done by routing information to the right person at the right time through user-defined rules and actions. BPA helps organizations streamline processes such as employee onboarding, accounts payable, contract management and more. Process challenge: The college committed to an initiative that would increase enrollment by more than 65 percent by 2025. This meant the college needed to hire new employees to manage the influx of students while keeping costs down. The legacy HR onboarding process, however, was paper-driven and time-intensive. If the college was going to meet its goal, it needed to eliminate inefficiencies and streamline employee onboarding. Automating HR onboarding with Laserfiche enabled the College of Engineering to hire more than 3,400 employees in a little over one year. Other departments have also begun reengineering their own processes and sharing successes campus-wide. The new system has created a new culture of collaboration and innovation for the most efficient processes possible. 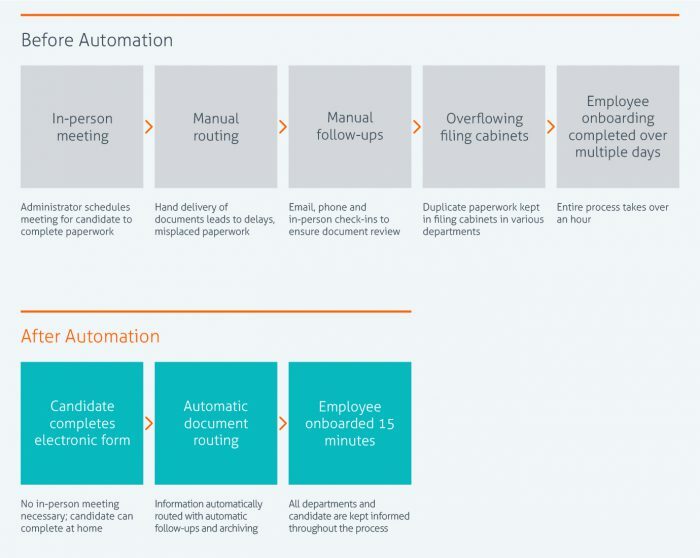 Click here to get the complete guide to HR automation. Process challenge: The City of Boca Raton’s accounts payable process relied heavily on paper invoices and copies being manually routed. Sometimes paper copies would be misplaced or delayed on someone’s desk, leading to unpaid invoices and upset vendors. Chasing down paperwork and answering phone calls from vendors was taking up employee time that could be better spent elsewhere. With its automation, the city tracks all invoices from the moment they are received through the final payment. The city significantly reduced processing errors while boosting customer satisfaction as a result of a faster and more efficient process. 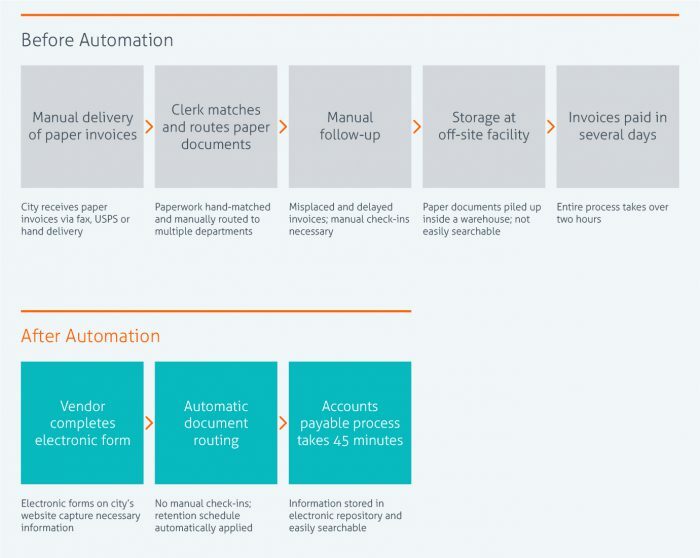 Click here to get the complete guide to accounts payable automation. Process challenge: Heifer International aims to lift 4 million families out of poverty by 2020. To do so, the nonprofit organization needed to increase efficiency and facilitate easier collaboration across its teams and partners worldwide. With documents built up from 70 years of work and hundreds of contracts requiring review per project, Heifer needed to centralize information and streamline contract management processes to help more people, faster. Heifer team members worldwide can now collaborate on projects that help families—whether they are in Arkansas or Nepal. Legal contract reviews are streamlined, expediting the execution of projects including delivery of food and supplies. Heifer continues to identify more back-office operations that can be made more efficient and free up resources for program initiatives. Click here to get a free introduction to electronic contract management.